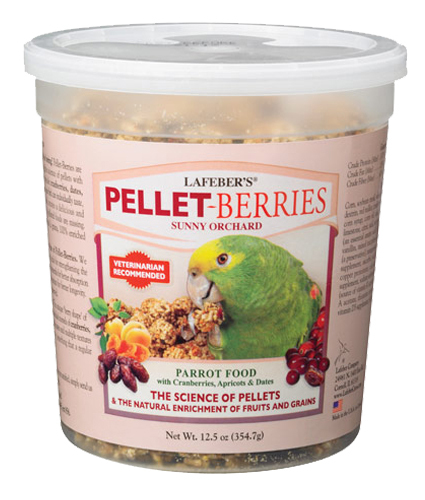 Lafeber Pellet-Berries solve parrot pellet boredom. Pellet-Berries are an exciting result of combining the science of pellets with natural enrichment. By mixing cranberries, dates, apricots, and natural grains that your bird can individually taste, feel and see, with a pelleted food, a delicious and wholesome meal is created that nearly all pelleted foods are missing. No longer does your bird need to eat fruits and grains that all taste the same and have the same texture because they have all been ground together. 81% pellets, 19% individual fruits and grains. Lafeber Bird Food understand the importance of pellets for companion birds. For many years veterinarians have understood the scientific benefits of pellets and this is why Pellet-Berries are made with 81% pellets. Now veterinarians are recommending scientifically balanced foods that also provide excellent foraging. This is why Pellet-Berries are made with 19% individual fruits and grains. Excellent nutrition in every bite of Pellet-Berries. Lafeber balance the omega 3 & 6 fatty acids to strengthen the immune system, add chelated minerals for better absorption, stabilize vitamins for better longevity and naturally preserve our foods.